You'd be a fool not to consider trying this low carb, cool, creamy and festive treat!
) Put 2 cups of raspberries in the blender or food processor. Add LC Natural Sweet or LC White Sugar Sweetener to taste; you want it fairly sweet.
) Whip cream with vanilla and about 2 Tablespoons of LC White Sugar Sweetener or Natural Sweet.
) 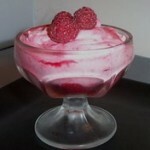 For a nice presentation, put a Tablespoon or so of raspberry puree in the bottom of a wine glass or clear dessert dish.
) Mix the rest of the puree in with the whipped cream, but don't mix it too well: You want to have wide streaks of red and various shades of pink throughout.
) 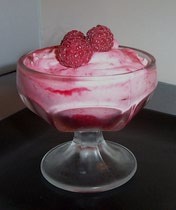 Spoon into dessert dishes and garnish with the rest of the raspberries (or mix some whole berries into the fool).